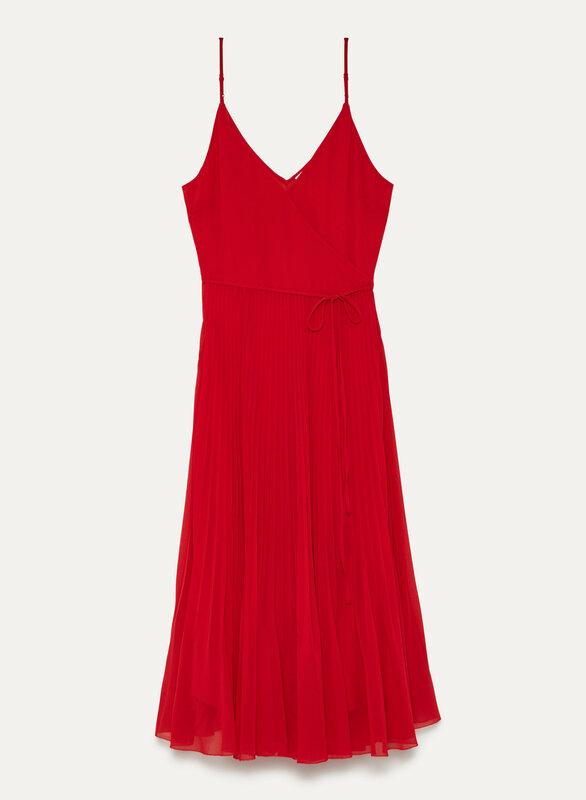 This midi dress is made with a beautiful chiffon. The wrap silhouette and sunburst pleats make for a flattering, flirty fit. Feel free to throw this one in the wash — the permanent pleats will keep their shape. I have a small bust (b-cup) and am used to wearing low-cut tops, however this dress is simply not functional. I purchased it for a wedding and was constantly readjusting trying to ensure the wrap stayed tight. You can reverse it for a more modest look, but the cut of the back isn't the most flattering. Wanted to love this, but I can't see myself wearing it again. Would recommend! True to size. Best for cup size C or smaller when wearing a size Small. I bought this in white and it’s stunning but a little see through in the chest area. Fits beautifully, flowy, and the perfect twirling dress. Beautiful pink colour but super low cut. The dress is great for a summer wedding but it’s a bit too low cut. Alternatively, you can wear it backwards so it’s not as low (: it runs a little large so size down. I got the beautiful pink colour! I love this dress. I was debating between the white and red and am so glad I go the red one!! I cannot wait till summer to wear it. Wonderfull dress. you can wearing every day or for evening. Get many compliment for dress. Good product, fit, i have recommended dress for friends. I bought bounty dresses 3x different colors. Perfect for a summer afternoon wedding. Romantic and a great twirler. I got loads of compliments, mostly from other women. Fits true to size with a loose cut, on the larger side. I sized down and was happy with the fit in the bodice. The v is sadly a little too deep for the office - you'd need something underneath - or I'd wear this all the time. Bought in the teal colour and it's beautiful! Very flattering and light. Excellent quality. Beware if you are on the bustier side (I am a 28G), the V is deep, but still lovely!